Kevin from vpsAO wrote in a few weeks ago to share their Los Angeles VPS offers with the community. 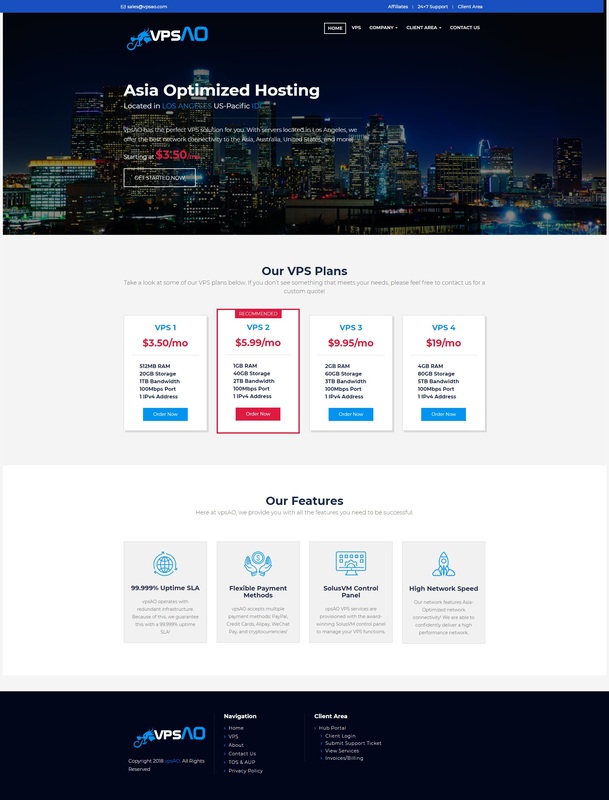 vpsAO.com appears to have been in business since 2016, but was acquired and is now funded by new management (RC Portfolio) as of October 2018. This is our first time featuring vpsAO’s offers here and we think you’ll enjoy these attractive offers they’re providing exclusive to our community! We look forward to hearing your feedback about their services and support quality considering the value of these specials, their new management, and their recent improvements! Their WHOIS is public, and you can find their ToS/Legal Docs here. They accept PayPal and Cryptocurrency (including altcoins) as payment methods. Adult content, Tor (relays only), IRC, proxies, and VPN are all allowed. We were also told that TUN/TAP and PPP are available within the control panel. vpsAO has infrastructure diversified between three different datacenters within the Los Angeles region. We’ve been informed that the following offers will be set up in Los Angeles, however there is no predictability as to which datacenter it will be set up in. You will either be provisioned on the QuadraNet, ColoCrossing or Psychz LA datacenter, as these special promotion packages will be set up between their excess/unused space between their infrastructure within those datacenters. We have been told that at this time, there is no option to select a preferred datacenter because the purpose of the special promotions is to fill up the “empty seats on the bus at a wholesale price,” (the analogy that Kevin mentioned) however, all locations should offer similar latency/performance considering they are all in Los Angele, and either way – you are getting a decent value server at wholesale-like pricing. If you have any questions or comments, please comment below and enjoy! Thank you for your sign up. If you have any questions, please let us know. I have order a 1.5GB plan it was set up in psychz DC. Network ms speed is very good, highly recommend it. Tempted but their aup policy conflicts with the offer…. Can I get written confirmation on what is actually allowed and not allowed generally speaking? I apologize if anything was not clear. I can confirm that Tor relays, IRC, Proxies, and VPN’s are allowed on our VPS services. Those speeds seem good for 100Mbps (nearly maxing the 100Mbps port). If you want to upgrade to 1Gbps, we have that option available too. Feel free to contact us nonetheless, we’d be happy to help you out and find a way to resolve this in a way that is satisfactory to you. This company does not recommend buying, and the merchant’s AFF fees are not paid, basically it is going bankrupt. Do you have a ticket number? I currently do not see any outstanding affiliate requests in our system, though, I do know in the past there were some delays in processing requests back when vpsAO was under previous management. This is no longer the case, and vpsAO is now backed by a sustainable and viable parent company, with new staff and resources available. This company does not recommend buying, and the merchant's AFF fees are not paid, basically it is going bankrupt. This appears to be a duplicate comment to the above. Nice offer but 1Gbps port would be better. Thank you. The option to upgrade to 1Gbps is available in the ordering form. You can upgrade to a 1gbps, as I did, but you can see my results above. This was fixed over the weekend. For full transparency, the issue was that we did not receive the email notifications that our WHMCS bill was due. This was not an error on WHMCS’s side, but on our side, as we (RC Portfolio) recently took over the assets of vpsAO and did not update the vendor notification email for WHMCS. We were only a few days past due on the license, so it did not trigger any license suspensions on our side, so was not made aware of the fact the license was suspended till now. We have sorted this out by updating the main email on file with whmcs.com/members and also set up a payment subscription to avoid this happening again. I am happy to send invoices/proof to any moderators, or you can contact WHMCS Support yourself to confirm that we have never ran a pirated install of WHMCS and that vpsao.com has been actively paying for a license even before now. This domain is not authorized to be using WHMCS. Please see above concerning this inquiry. Might order a year just to learn how to run a Tor relay. Since most hosts don’t allow it. Anyone purchased yet and can provide network speed test results? Test files are available in the original post for you to test the network speeds for yourself. I’m sure you definitely won’t be disappointed. Exit Nodes are not allowed as per the rules? Asked ahead of time if I could run folding@home, seti@home, and mining, the reply was “yeah you can”. So I signed up, did the 3 yr pre-pay to get the double RAM, storage and bandwidth as advertised in the offer. Also paid for an extra vCPU core. Did not get the RAM/Storage/Bandwidth increases, nor did I get the vCPU core I paid for. When I asked about it the same person that told me “yeah you can” replied that they don’t allow mining. I asked if folding@home and Seti@home also counted as “mining” and the reply was “we don’t allow mining”. Very poor communication, and misleading ad. Feels like a scam to me. Kevin, from looking at other comments, it looks like you’re the guy to be talking to. I’d like to chat with you if you have a a few minutes. Please email me at kevin [@] vpsao [.] com. I would love to have a chat with you Aaron. Kevin, Did you get my emails on the 9th and 11th? I haven’t gotten a reply. Still no replies to any of my emails or tickets I’ve opened with support. I will be issuing a chargeback through my bank and reporting this as fraud. Are you related to HiFormance? What about policy on torrents? Network speed: Good, except I’ve upgraded to 1Gbps port and still have these speeds as a 100Mbps port. I’ll open a ticket to solve this. I’ll wait a couple of days and see if the disk seek speed gets better and stops with this occasionally hangs, otherwise I might ask for a refund. Well, I’ve asked for a refund. Tried to install openjdk-8-jdk, it took more than half an hour and didn’t finish. I gave up, will look for other VPS provider. They asked to move the VPS to another location to solve the disk access problem. I’ll give it a try before proceeding with the refund. I got my refund ;), changing the location didn’t solve my issues with disk response time and ssh dropping the connection. Bought the LEB 3GB Special bundle and was happy with the server but after 5 days the VPS has started to become slow. I see your site has a $7/year plan that has 2GB RAM, which seems like a better deal than the ones you offer here. So I went and ordered that one last week. I’ve installed Virtualmin on CentOS 7, and transferred various sites hosted on other capable servers. So far everything has gone smoothly. I used only one day: the server periodically does not ping, the speed of the disk, as stated above, is low. I do not recommend choosing this provider. Disk speed is agonizingly slow. As long as you are not in a hurry, it seems like an ok deal at $9 per year. Simple web pages take many seconds to display when hosted on here. Their ad says “Double with 3-year pre-pay” on Bandwidth, RAM and Disk. I prepaid for 3 years and didn’t get it. I also paid extra for an additional vCPU and didn’t get it. The same guy answers billing email and support email. I’ve been trying to get this cleared up since the 8th. All he’ll respond with is that it’s beyond his expertise and he’s escalated to another department. I’ve emailed Kevin twice with no response. Pretty sure I’m getting the run around. I will have to file a fraud report with my bank and issue a charge back. Super irritating. Paid for a server a week ago and they still can’t set it up. Ticket is also pending for 4 days already. Looks like scam. Same here, and their service/support is appalling about letting us know what is happening. Even just a simple message saying “Sorry, we currently don’t have any servers available, you can expect to wait a week” would be better. I’ve escalated an issue to PayPal asking for a full refund. I signed up for this offer. The VPS was never provisioned, support failed to reply to tickets. I eventually had to go through PayPal resolutions to try and get my money refunded. This is one to avoid at all costs! Do you allow Private torrents? When they do work, VPS is awfully slow – even with a simple wordpress blog. Better hand out your cash to homeless people, more good will come out of it.